Our wedding is 10 days away and I have all things wedding on my mind! 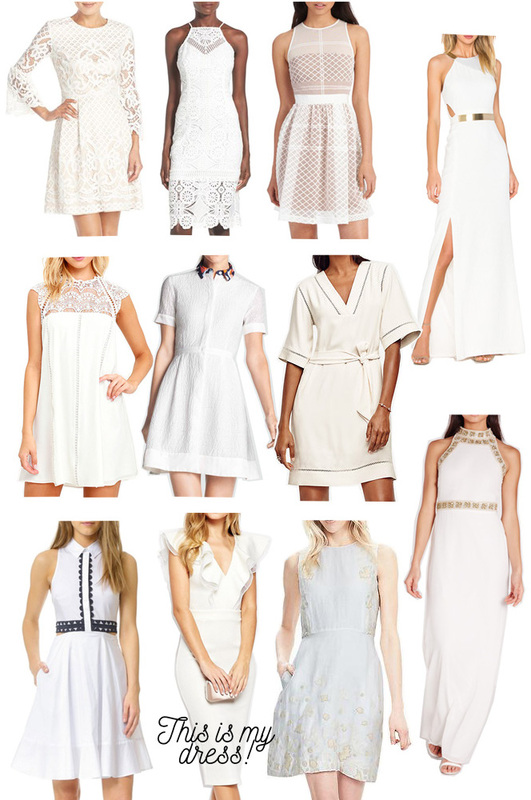 Today I thought I would share some great dress options for the rehearsal/rehearsal dinner (or shower, or engagement party, or even just a summer soiree!). There have been few occasions in the bridal process where I felt required to wear a white dress. I felt like it was a little cliche (god forbid I do anything cliche! ), plus many of our wedding events took place in the winter or early spring and white just didn't feel right. For the rehearsal and corresponding dinner, however, it seemed like a necessity. Above are some great options ranging from casual to formal. I purchased this one for the affair a few months back and I am so excited to wear it! I'll be sure to share photos on here in the coming weeks.